Building relationships with your prospects and clients can be an overwhelming task, especially with all the time constraints you face as an agency owner. In order to solidify those contacts, you need a process in place that will keep your agency's name in front of your clients on a consistent basis. 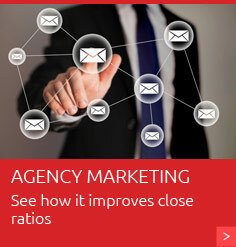 AgencyBuzz is an agency marketing tool designed specifically for insurance agents. No longer are you forced to store clients in generic mailings lists with systems not designed for the insurance industry. With the AgencyBuzz system, each contact can be assigned a status of prospect, customer or lost for each line of business you offer. 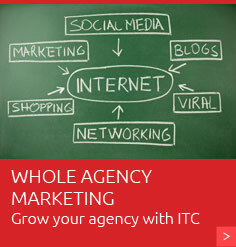 With ITC's years of experience in providing industry leading Internet marketing experience, we have created this easy-to-use tool that will automate the personal touch your prospects and clients expect from your agency. With the Insurance Website Builder Emerald Plan, you get our digital agency marketing system AgencyBuzz. This includes 25,000 emails per month and unlimited access to our content and design libraries. Close more sales by staying in constant communication with your prospects. You can assure that your agency stays fresh and top of mind. No longer do you have to sort through your management system to find who you should be following up with. With the AgencyBuzz system, you can create a marketing workflow that works for your agency. Using our integrated drip marketing process you can send an email one day and follow up with a phone call on another day. Why waste time worrying about losing your valuable insurance leads due to a busy office or hectic schedule? The automated nature of our system will keep those regular touches going, even when you and you agents do not have time. What happens when a prospect is turned into a client? AgencyBuzz will automatically send the new client a thank you email. Move on to the next sale without worrying about following up on new sales. Looking to send a homeowners drip marketing mailing to all of your automobile prospects? With the easy-to-use search features in AgencyBuzz, you can send mailings to specific subsets of your customers. With many designs to choose from, you can select the design that best meets the style and design of your agency. After choosing the perfect design, send insurance-related content by writing your own or choosing from our library of more than 200 content pieces. New content is added monthly so your message can stay fresh. Automatically send birthday, anniversary and holiday greetings to your customers. Have multiple agents and locations? No problem. Each contact can be assigned a primary agent and location. This allows you to market to select locations and geographic regions while maintaining the one-to-one relationship your agents require. AgencyBuzz is easy to use and interfaces with many software programs, eliminating the need for you to re-key your lead data. Simply import your leads and customer database into the program with just a few clicks of the mouse. With the built-in web API, third-party applications can be directly integrated into the AgencyBuzz system. This includes our TurboRater Comparative Rating System, which has one click import to the marketing system.